The information below is intended to eliminate the guesswork of building a well-diversified portfolio appropriate for your retirement goals and ability to accept market volatility. To view a list of all of the investment options available in your plan including fees, risks, and historical returns, please login to your account. Which Strategy Best Matches Your Needs? Offers a time-adjusted portfolio that glide path you down the risk exposure as you get closer to retirement. Offers a better income risk management strategy. Match the right portfolio to both your age and risk behavior. Suitable for someone who is more comfortable in managing their investments. IFA Index Portfolios also have glide path options. 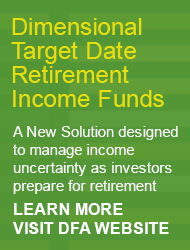 Dimensional’s Target Date Retirement Income Funds are designed to be diversified across a mix of asset classes that include stocks and bonds. Over time, the investment emphasis shifts from income growth to income risk management. Contributions are invested primarily in Income-Growth Assets, which are expected to increase in value over time. The investment focus shifts from growing income to managing income risk, with more portfolio assets invested in inflation-protected securities to manage future retirement income risk. The portfolio remains focused on Income Risk Management Assets in an effort to guard against risks like inflation or a market downturn. Assumptions and forecasts used by Dimensional in developing the funds’ asset allocation glide path may not be in line with future capital market returns and participant savings activities, which could result in losses near, at, or after the target date year. By choosing a Dimensional Target Date Retirement Income Fund, you can take an important step toward planning for retirement. 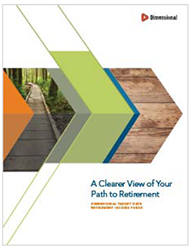 Whether your retirement date is near or many years from now, focusing on income can help you see where you are headed—allowing you to better plan today and giving you a clearer view of your path to retirement. The funds are offered in five-year increments, with the target date indicating when an investor may expect to retire and stop making contributions in the fund. For example, if it is 2015 and you expect to work another 30 years, the 2045 fund might be an appropriate target date fund for you. If you are planning to retire earlier or work longer, you can choose a fund with a date closer to your anticipated retirement. Allocation and holdings are subject to change. Please see the prospectus for more information on target ranges for allocations to underlying stock and bond funds. Stocks include US and Non US (Global) Equity Funds. Bonds include portions of Global Fixed-Income Funds and Inflation Protected Liability Driven Investment (LDI). Having narrowed down your desired portfolio, login to your retirement plan account to adjust your investment elections. For support with this process here are step-by-step instructions. 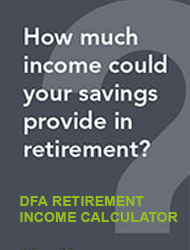 For advice on selecting a portfolio, please contact IFA. We are happy to help. Begin by clicking on the Portfolio matching to your age. Review the historical risk and return characteristics of the benchmark portfolio1 to make sure this is an appropriate portfolio for you. Should this not be quite right, you may click on another portfolio. A portfolio with a lower number will have a reduced risk profile (and expected return); a higher number portfolio will have an increased risk profile (and expected return). 1. The Benchmark Portfolio provided below should be used to help you understand the historical risk and return characteristics of your selected portfolio. Please note that the Benchmark Portfolio may have a slightly different allocation due to limitations with your plan's recordkeeper, but does have the same General Asset Class allocation. For all non-investment related account inquiries, including the following items, please call Aspire Financial at the number listed below.